Benedicte Valentiner was Managing Director of Blair House from 1988 to 2001. During this time, she served four Presidents (from Presidents Reagan to George W. Bush) and six Secretaries of State. Bedtime and Other Stories from The President’s Guest House presents Mrs. Valentiner’s unique behind the scenes experiences managing one of the world’s most prestigious, historic and beautiful official government guest houses. 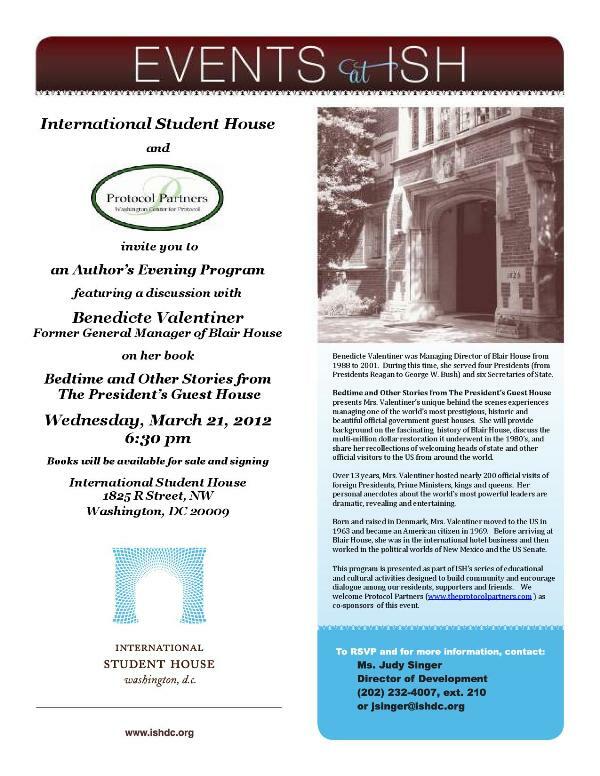 She will provide background on the fascinating history of Blair House, discuss the multi-million dollar restoration it underwent in the 1980’s, and share her recollections of welcoming heads of state and other official visitors to the US from around the world. Over 13 years, Mrs. Valentiner hosted nearly 200 official visits of foreign Presidents, Prime Ministers, kings and queens. Her personal anecdotes about the world’s most powerful leaders are dramatic, revealing and entertaining. Born and raised in Denmark, Mrs. Valentiner moved to the US in 1963 and became an American citizen in 1969. Before arriving at Blair House, she was in the international hotel business and then worked in the political worlds of New Mexico and the US Senate. This program is presented as part of ISH’s series of educational and cultural activities designed to build community and encourage dialogue among our residents, supporters and friends. We welcome Protocol Partners (www.theprotocolpartners.com ) as co-sponsors of this event.